Graph showing the long-term trend of people who consider their families to be “mahirap”, or poor. Fewer Filipino families consider themselves to be poor, down by about 900,000 families, according to a new quarterly survey. 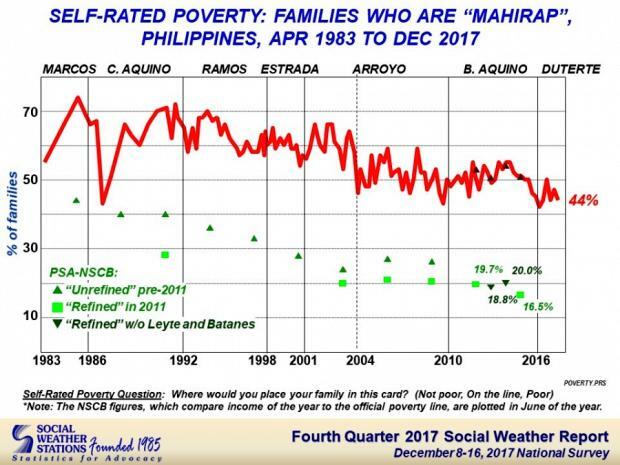 A Social Weather Stations (SWS) poll released today (Wednesday, January 17) found that 44 per cent — or an estimated 10 million families — continue to class themselves as poor. A similar survey in September found that 47 per cent — or about 10.9 million families — gave the same answer. “This gives an average Self-Rated Poverty of 46 per cent for all quarters of 2017, two points short of the record-low average 44 per cent of 2016,” the SWS said in a press release. The biggest fall was recorded on the Island of Luzon — excluding Metro Manila — where the number of those considering themselves poor dropped from 50 per cent to 40. The only place where the figure rose was the Island of Mindanao, where the figure went up from 45 per cent to 52. The survey also found that 32 per cent of respondents — or an estimated 7.3 million families — rated their food as ‘poor’. This figure is unchanged from September. “The steady nationwide self-rated food poverty in the fourth quarter of 2017 was due to increases in Mindanao and Metro Manila, combined with a decrease in the Visayas, and a steady score in Balance Luzon,” the SWS said. According to SWS, the monthly budget a household needs in order not to consider itself poor is 15,000 pesos. The figure for a family to be considered ‘food-poor’ is 6,000. The survey was conducted using face-to-face interviews with 1,200 adults nationwide, with 300 each in Metro Manila, Luzon, Visayas and Mindanao. The survey has a margin of error of ±3 per cent nationwide, ±4 per cent for Luzon, and ±6 per cent each for Metro Manila, Visayas and Mindanao, the polling body said.